Check out the following graph, one of many highlighted in a post today by NewsWhip. From September 1-24, the site sliced, diced and analyzed the social media metrics of seven leading business news sites. 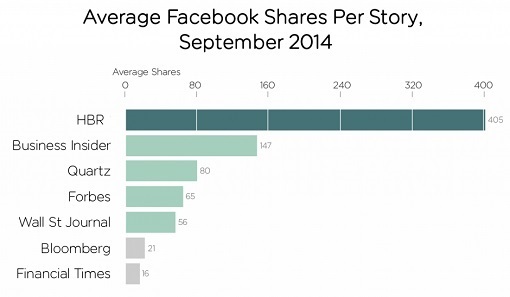 In terms of overall Facebook engagement, Business Insider is the winner. But as you can see above, when it comes to the social network’s rough equivalent to a per-capita metric, The Harvard Busines Review (HBR) is way ahead. HBR is even further ahead in the Average Tweets Per Story category. Read the rest of Liam Corcoran’s shared findings here.